Some football analogy: Superbowl 51 had the New England Patriots down 28-3 with 17 minutes left in regulation. And somehow they came back to win in dramatic fashion. Until they mounted their historical come back, Patriot fans weren't happy. The juxtaposition that came within a matter of an hour is really unbelievable. The joy that come back brought to Patriot fans BECAUSE they thought all was lost was greater than that of what would have been had they been winning the whole time. A similar thing happened in the 2015 Michigan State vs Michigan football game, that was summed up in one play. All UM had to do was punt the ball away and the game was won for them. MSU fans thought the game was over. Check it out. That was a glorious day indeed (For MSU fans). The point is, when victory is snatched from the jaws of defeat the celebration is greater than when things are certain. Even if you don't like MSU you can see the point. One of the greatest obstacles to overcoming one's addictions is internal thoughts of worthlessness. Whatever events and moments in your life that have led you to your struggle with addiction does not define who you are. There are countless people in history who have made incredible life changes to the joy of heaven. 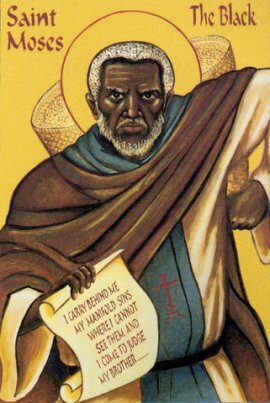 Take St. Moses the Ethiopian (aka St. Moses the Black). He was a bad dude. Originally a servant of an important man he was banished away for committing robbery and murder. He joined a band of thieves who ruthlessly stole goods and took lives. As a result of his fearlessness, strength, and the fact that he was a big big man, he was made leader of the group. He continued to do awful things to people and the very sound of his name brought on fear in the region. There is no way a guy like him would ever change. Or so it would seem. However, his heart was pierced by the love of God and he wanted to change. He went to a monastery where they even had a hard time believing he was there to make a change and would not let him in. After a long time of tears and sincere repentance, they let him in and he turned his life around. Have you ever witnessed a comeback? Perhaps it was a favorite sports team. Or perhaps in something work or school related. You're mounting a comeback. It doesn't usually happen in one play like the MSU game, it usually comes slowly and subtly like Superbowl 51. Mount the comeback. You can do this. B. In the Fortify Program, Update the battle tracker. No Video Today. Finish the "Your Story" activity and you'll be done with week one. D. Journal the following: 1. What's the greatest comeback you can think of? 2. Where am I on the comeback? 3. What do i need to do to "move the ball up field?" You might not score on one play, so come up with some ideas for a "short run" or "quick pass" aka What are some small things I can do to accomplish this goal? Todays Tips: When the urges come get up. Stretch. Breathe. Go do something physical. Get away from your phone and computer. Throw a ball around, even its against a wall by yourself. Play ping pong. Play something. Just make it physical if you can do that. If you can't move physically, play a board game or something that does not involve technology.